In 2001 Polish priest Sylwester Zawadzki came up with the idea to erect the biggest statue of Jesus Christ in the world on the outskirts of Świebodzin. The local authorities, church and citizens of the town mobilized to create this religious monument, and sculptor Mirosław Patecki was commissioned to design it. The statue Christ the King was inaugurated ten years later in November 2010, about sixty kilometers from the German-Polish border and not far from the highway and train tracks of the Berlin–Warsaw line. The figure and its base reach over fifty meters, roughly the size of a ten-story housing block. It has already attracted thousands of worshipers and pilgrims and thus contributes to bringing tourism and economic development to the structurally weak border region. There are future plans to establish a modern pilgrimage center, and to promote the statue worldwide—something that we also contribute to within the 7th Berlin Biennale. During the exhibition the artist creates a replica of Christ’s head and turns the first floor of KW into his studio. Patecki doesn’t celebrate his artistic autonomy; rather he offers his services to the church, and that gave him the opportunity to create the giant figure of Jesus. Yet he is not really satisfied with the result. Lack of money, shoddy materials, and an unprofessional team transformed it into a dummy rather than a finished art object. But still it is able to induce religious enlightenment, and according to Patecki this is one of the roles of good art. In the Berlin Biennale, the sculptor is given full control over the process of creation and hopefully a perfect face of Jesus will be presented to the public. The Christ the King statue confirms the institutionalized power of the Polish Catholic Church and its use of art. Bringing Christ the King into the realm of contemporary art, we try to do what the Vatican planned with its announced participation in the Venice Biennale—to show how powerful, ideological, and impressive religious art, and art in general, can be today. Not only in the new global churches in Nigeria or India, but also still in Central Europe, 100 kilometers from Berlin. Beyond documents the final phase of the construction of Christ the King in Świebodzin, when it was still not clear if the combination of compromised engineering techniques and the parish priest’s faith in the project would actually lead to its completion. For example, an unanticipated change in the dimensions of the figure caused problems with its placement, forcing it to be rotated thirty degrees to the left, so that Christ’s gaze turned away from the town toward its periphery and the outlying TESCO supermarket. The effort to erect such a monument in the middle of nowhere recalls the old saying: faith can move mountains. 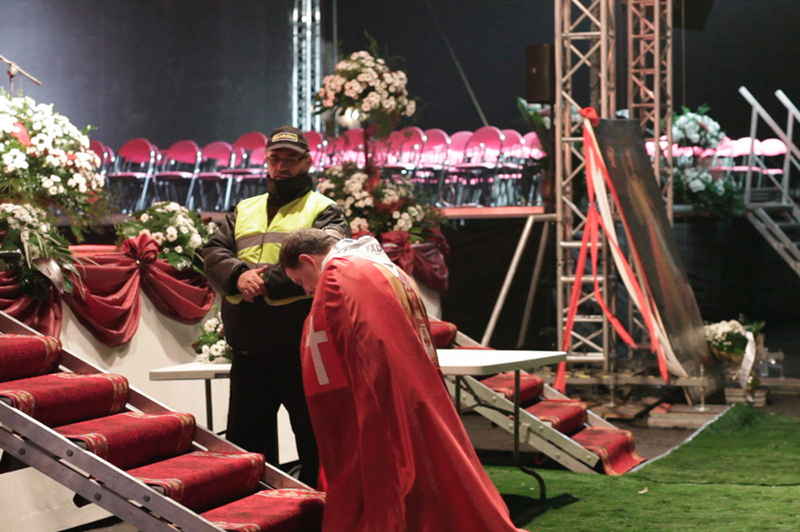 Facing the Scene was shot in November 2010, depicts the inauguration of the statue Christ the King. It concentrates on the logistics and preparation for the event, as well as its dismantling at the end of the celebrations. Meticulously observing the church community gathered for this ritual, the film shows everything from health and safety measures to people’s genuine awe and the public manifestations of belief embodied in the sculpture. It’s a kind of anthropological investigation of how the consumption of holiness is packaged. Film still from “Facing the Scene”, Courtesy Anna Baranowska and Luise Schröder (Anna is an artist whose work deals with collective social phenomena and the mass media landscape of our time. Luise is an artist, art mediator, and activist who is interested in aspects of history in the making and its reconstruction). All texts by Artur Żmijewski and Joanna Warsza. Text source http://www.berlinbiennale.de/blog/en/projects/christ-the-king-by-miroslaw-patecki-22844, http://www.berlinbiennale.de/blog/en/projects/beyond-by-lou-cantor-22883 and http://www.berlinbiennale.de/blog/en/projects/„facing-the-scene”-by-anna-baranowska-and-luise-schroder-22861. This entry was posted in Art Centre, Installation, Periodic Art Event (biennale, triennale, etc), Sculpture, Video and tagged 7th BERLIN BIENNALE, ANNA BARANOWSKA AND LUISE SCHRÖDER, LOU CANTOR, MIROSŁAW PATECKI.